Yesterday, I used up the last few home-grown apples - peeling, slicing and briefly heating in the microwave to soften, and then freezing for winter use. They will come in useful when making apple pies for the festive season. As I cut through the last apple, I felt inspired to share a few useful tips on apples. When cut, apples gradually turn brown, so if you have to peel or cut it ahead of using, brush with lemon juice to destroy the enzyme that causes this reaction, or keep it in water with a little lemon juice. If you want apples to break up in cooking, cook with a little water but no sugar until the end of cooking. If you want the pieces to keep their shape, add sugar at the beginning of cooking, as it draws moisture from the fruit so that the pieces hold together. Always cook apples with the minimum of water as they release a lot of their high water content when heated. Although the apple harvest starts as summer turns toward autumn and ends around mid-winter, today we expect to find good 'fresh' apples at the supermarket all year round. The apple industry meets this demand by growing mainly varieties that will keep well in cool storage, or more correctly in Controlled Atmosphere storage, a precisely controlled condition that puts the fruit to 'sleep', so that, theoretically, it emerges as fresh as it went in - though it is obvious to consumers that some out-of-season apples have come through better than others. 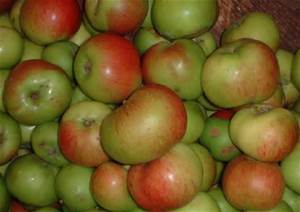 Many apples are sprayed with a high-gloss wax before going on sale. This is done simply to make them look good. The wax, which is the same as that used to coat jellybeans, is quite harmless to eat. In an unwaxed apple, a softly glowing skin is a sign of good condition. 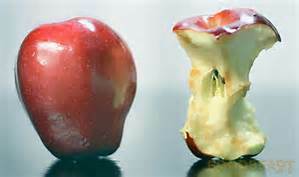 Don't keep apples in the fruit bowl: they will hold their texture and flavour much better if kept in the refrigerator. Don't wash them until you are ready to use them. 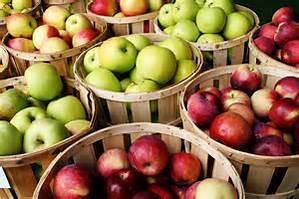 To store large quantities of apples, place them, not touching, in a cool,dark place where plenty of air can circulate, for example on slatted shelves or in a pull-out wire basket. All apples are good to eat raw; the choice depends on your taste, from bramleys and granny smiths at the tart end of the scale, through pink ladies and jonathons with their excellent balance of acidity and sweetness, to red and golden delicious, which are aromatic, sweet and juicy, but to some apple-fanciers, a bit insipid because they lack sharpness. If you are buying apples for cooking, select the right type for your purpose: low-sugar apples, such as bramley, will cook to a puree, while higher-sugar varieties will keep their shape better. Better still - grow your own! I only have a small orchard but it satisfies our needs for a variety of apples for both eating an cooking!